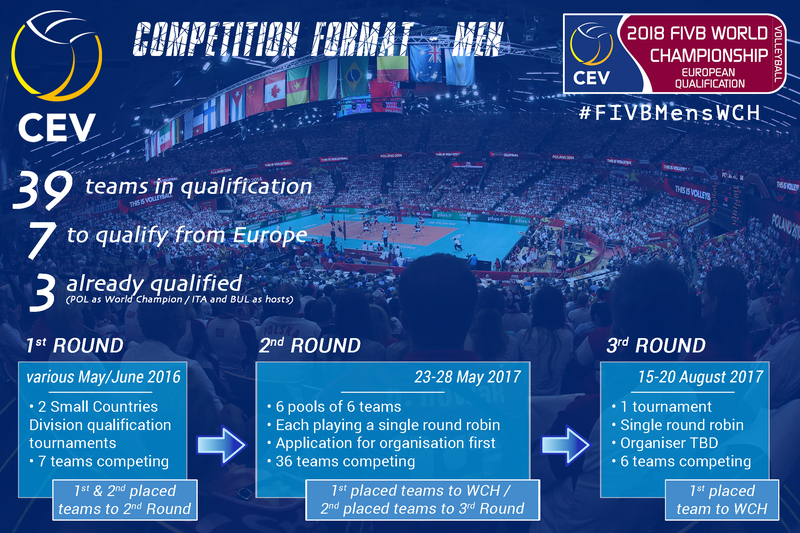 Luxembourg, May 3, 2016 - The CEV Board of Administration has approved the formula of the European qualification process for the 2018 FIVB Volleyball World Championships which will take place in Italy and Bulgaria (men) and Japan (women). Italy will host their third successive World Championship - they hosted the men’s competition in 2010 and the women’s tournament in 2014 - and also hosted the men's World Championship in 1978. It will be the first time a World Championship is co-hosted by two countries. Japan, on the other hand, will play host to the women’s Worlds for the fifth time after events in 1967, 1998, 2006 and 2010. With 2014 gold medallists Poland and hosts Italy and Bulgaria already qualified for the 2018 Men’s World Championship, an additional 39 men's teams have registered to participate in the qualification process which will deliver another seven tickets for the Final Round. The qualification process will begin in May/June this year with the first round featuring teams from the Small Countries Division; out of two first round qualifiers, the first and second placed teams from each tournament will progress to the second round. The qualification process will resume from May 23 to 28, 2017 with six pools of six teams each. The eventual winners of these second round qualifiers will secure their participation in the World Championship whilst the second placed teams will move on to a third and last qualifying round due to take place from August 15 to 20, 2017. One tournament featuring six teams will be played on these dates and the eventual winners will book a spot in the Final Round of the World Championship which will reach its climax in Turin, the city that hosted the 2006 Winter Olympics. For the Women’s World Championship, as many as 42 European teams are involved in the qualification process with eight tickets to Japan up for grabs. The round structure is the same as for the men, but only the winners of the first round tournaments involving teams from the Small Countries Division will move on to the second round. 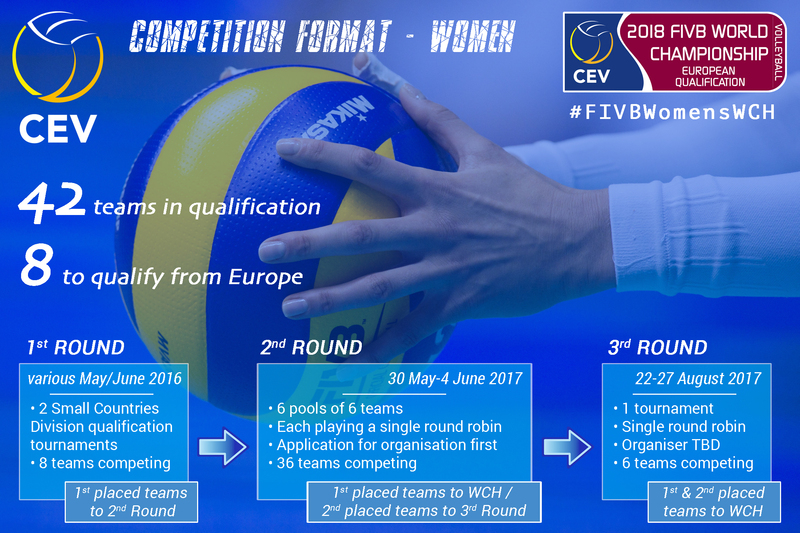 The second (May 30-June 4, 2017) and third round (August 22-27, 2017) qualifiers for the women will follow the men’s tournaments. In the third round, the team placed first and the eventual runners-up will book their spot in the Final Round to join the winners of the second round qualifiers and complete the European contingent for the world’s premier volleyball competition. List of European countries participating in the World Championship qualification process.